Book Review: After the Kiss by Terra Elan McVoy – Hey, Library Girl! Becca and Alec are the perfect “it” couple. She’s fallen for him hard. Camille is the new girl in town and is careful with her heart. She moves around so much that she never gets invested in much, especially since leaving Chicago. Then she receives an unexpected kiss from a mysterious boy and her world is turned upside down. Unfortunately, the mystery boy is the same Alec who is the center of Becca’s world. Told in split-point-of-view from both Becca (verse) and Camille (second-person stream-of-consciousness), Terra Elan McVoy’s novel examines what happens when two girls have to climb outside of their own heads and deal with their actual lives. This novel is an exploration of not only the aftermath of an ill-advised kiss, but an exploration of what comes after first love, first heartbreak–and perhaps more important–after high school. Subtle, smart, and never too didactic, McVoy’s story is strong contemporary YA. Although it’s a strong story in general, it’s not perfect. Camille is hard to get to know as a character. Her stream-of-consciousness is off-putting at first, and there are often too many words used, requiring the reader to really dig for the essence of her meaning. Becca’s verse is mostly successful, but there are times when she slides into the slightly nonsensical. Both girls have distinct, authentic teenage voices, which is essential for a story as narrative-driven as this one is. Although it would be easy to allow this story to devolve into a basic cat-fight over a rather uninteresting boy (the boy is kept bland on purpose here), McVoy doesn’t allow it to happen. Instead, she crafts a complex tale about two girls who are complete strangers with a single event linking them. A complicated, tenuous relationship forms as a result, and it never feels forced or unrealistic. The story’s ambiguous ending helps add a feeling of realness to it as well. It’s also worth noting that McVoy populates her story with literary references that are delightfully unobtrusive: readers in the know will revel in them while those who aren’t familiar will be able to let them slip by without missing out on the meat of the story. This reader loved, loved, loved them. Recommended. This is a slow-burn of a read. 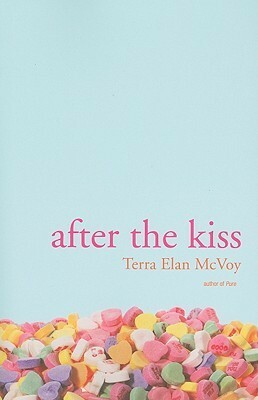 After the Kiss by Terra Elan McVoy. Simon Pulse: 2010. Library copy. I liked this book so much — loved it, but I definitely see some of the issues you talked about. It took me a little while to get into the stream-of-consciousness writing, but once I did I absolutely loved it. I found it compulsively readable, to be sure. I can see why you loved it. It’s different, but it has McVoy’s trademark thoughtful, authentic teenagers in it. It was the first McVoy book I read and I think her writing is so different from many other contemporary YA writers, though in a quiet sort of way, if that makes sense.